On My Rig You Can Reserve What Spot You're In. Please See - For How The Rail's Laid Out.. Yes - we’ve had several of my best trips in YEARS. That DOES NOT MEAN IT'S ABOUT TO HAPPEN AGAIN!! ("Ah, Capt., I thought we'd catch 20 pounders today?") Oh Mercy! Sunday 2/10/19 - 11 Hour Tog Trip- Depart 6:30 to 5:30 - $150.00 - 16 Sells Out.. Trips Also Announced on socialized media at Morning Star Fishing & my personal FB page..
Bait is provided on all trips: green crabs for tog. (Whites MIGHT be available from crew for a reasonable cost..) Our Tog Pool Is By Length: A Tog That's Been Released Counts The Same As One In The Boat.Rental Rods are $7.00.. Each A Rod I'd Use Myself. Wear Boots! Sneakers this time of year can ruin your trip. Be a half hour early! We always leave early! ..except when someone shows up right on time. Clients arriving late will see the west end of an east bound boat. With a limited number of reserved spots, I do not refund because you over-slept or had a flat.. It's Simple To Prevent Motion Sickness, Difficult To Cure. Bonine seems best because it's non-drowsy. Truly cheap & effective insurance. Honestly - If you get to go on the ocean once month, once a year, or even less; why risk chumming all day? Similarly, if you howl at the moon all night, chances are good you'll howl into a bucket all day. Bring A Cooler With Ice For Your Fish – A 48 Quart Cooler Is Fine For A Few People. Do Not Bring A Very Large Cooler. We DO have a few loaners - you'll still need ice. No Galley! Bring Food & Beverages To Suit. A few beers in cans is fine for the ride home. Sponsor the Ocean City Reef Foundation! We're Nowhere Near Reef Building's True Potential. - 56 at Al Berger's Reef. After getting my head handed to me last winter, I feel fortunate indeed to get some trips this January/ February. While some have been miraculous including three 19 pounders, most were not. As I write, some 40 minutes into my Super Bowl Sunday trip, we’ve had 5 fish over 10 lbs, make that 6: it’s the best bite yet in this series of trips. But these are the fish these die-hard blackfishermen want to catch this time of year. A tog that, though drag set very tight, can pull against it for 30 or 40 feet; the powerful tail thrusts thumping as none of our other reef fish are capable. So we go - and gamble. They do not always bite.. Not at all. I’ve written fairly extensively on how we can make toggin better; have put a lot of work into just that with reef building & comments on regulation. . .
Now I personally support Wind Energy development. Similar to the Gulf of Mexico’s oil rigs, it will be the greatest boon ever to our reef fisheries - Ever. I also happen to think the good folks who can put a bunch of satellites up that give me precise positioning, who offer cell service around the globe, and who can see inside your brain magnetically, or sequence genes to determine likelihood of illness — Yes, those folks, those scientists, can read a bunch of thermometers and see that the earth is warming. Those same folks think the atmosphere is getting too much CO2 and it’s vital that we reduce emissions. Another thing CO2 emissions do is increase ocean acidification. First thing to go will be shell formation. Water’s too acidic? No shell. I listened to a group of British trawl skippers give a presentation to the Mid-Atlantic Council. While they had indeed lost fishing ground to ‘The London Array’ a huge fully developed wind field, they said small boat trap fishers, like conch potters, had benefited big time. So the very thing that can prevent, or at least lessen, catastrophic ocean acidification also benefits most fisheries. Interesting. Sounds like a plan to me. So I’d raised the devil about these ‘subbottom profiler’ surveys. Didn’t make me any friends in guvmint - promise. Yet I was certain - 100% positive - the complete disappearance of sea bass & fluke from this enormous area was at the fault of subbottom profilers - the survey boats. BOEM claims this survey equipment “is as quiet as a ship’s propeller” ..and maybe so. But it scares the bejeezus out of some fish. On August 16th, 2015 I filmed some of the area at the conclusion of surveying. I chose the spots to film because I had comparative video from 2004 of the exact same places. If we saw a single sea bass all day, I don’t recall it. Did see tog and even a few cod though. The day Rick came in to do his state-required reef site survey. 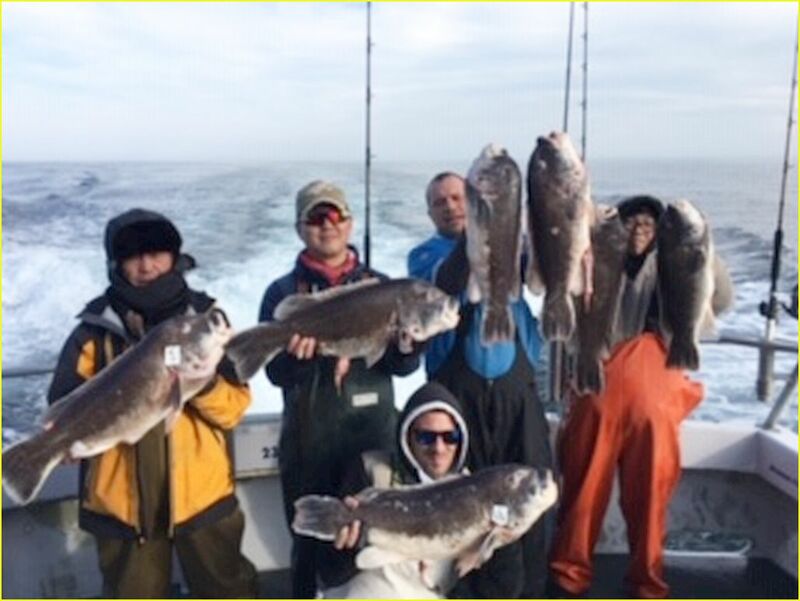 Clients were catching like mad - what we call a “drop & reel bite” of sea bass. As Rick turned into his first leg - the bite turned off as if by a switch. And it was a switch. He’d turned on his subbottom profiler and the fish quit. I asked what he’d turned on — and would he please turn it off! — the bite resumed at a more tepid pace. My second unquestionable encounter with this survey gear was (circa June of 2013). By then I could tell when a survey boat was 7 miles away and coming. As the fish slowed I’d turn on my radar; I could see the bite taper as the boat closed & then quit absolutely when a survey boat was 3 miles away. The southernmost point of these surveys was about 2.5 miles above our largest, most developed artificial reef, the Great Eastern Reef. At that point I’d been sea bass fishing 33 years. I knew their behavior. It wasn’t a current switch or fishing pressure; these two examples clearly illustrate how a subbottom profiler stops sea bass from feeding. What I didn’t realize at that early stage of the surveying was that, eventually, enough of this survey noise, 3+ years of it, would drive the fish completely out of the MDWEA and for at least 3 additional miles around the entirety of it’s perimeter. I had the impacted area measured by some folks who are extremely skilled with charting - it was just over 500 square miles. If we can move these giant shoals of bait away from the shipping lanes, the whales will follow. Or perhaps they will be irritated by these sounders themselves and move regardless what their food does.. Either way, it’s worth a shot. MD has a boat equipped with subbottom sounders, I would assume NOAA & Virginia do as well. BOEM still maintains their survey work does nothing to fish - nothing at all. Why, “it’s as quiet as a ship’s propeller...” Maybe another agency will try this idea - keeping whales out of harm’s way would be a good thing.